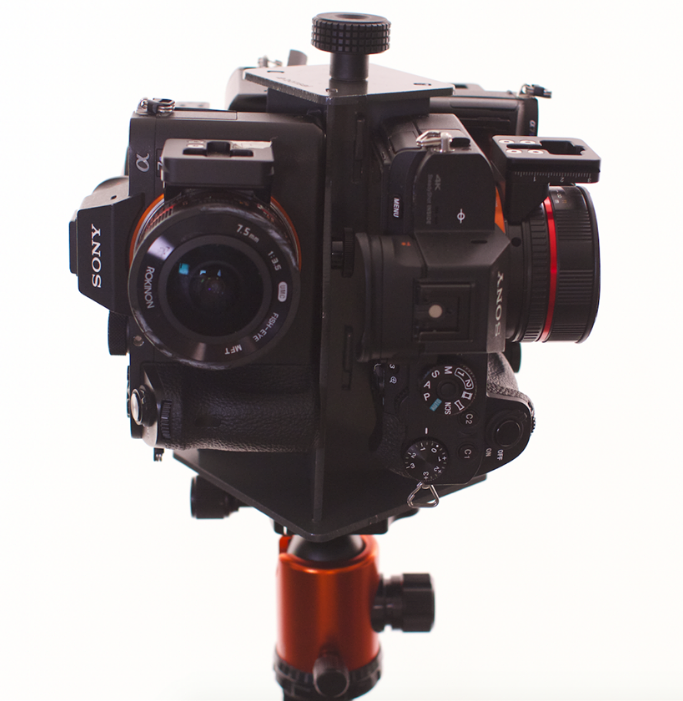 Excalibur is a 360 camera rig for four Sony A7S cameras with full frame sensors for exceptional high image quality. A camera’s image quality, whether for photo or video, depends in large part on the sensor. In general, all other factors being equal, larger sensors have a higher quality compared to a smaller sensor simply because a larger sensor is able to collect more light, thus improving the signal-to-noise ratio. Most 360 cameras use small sensors partly because of cost, but also because larger sensors require larger lenses. As a result the sensors in 360 cameras are usually 1/2.3 inch or smaller. Because of this they have limited bit depth, dynamic range, and low light performance. Bonsai, a 360 video technology company, has created a 360 camera rig called Excalibur that utilizes four full frame mirrorless or DSLR cameras, such as the Sony A7S paired with Rokinon 8mm circular fisheye lenses. By using cameras with full frame sensors, the rig is able to capture very high quality 360 video, with up to 6k resolution. The Excalibur rig includes a remote control to trigger all four camera at once. Bonsai also has a custom software called Arborist to automatically sort all the video files into scenes for stitching. Starting in April, they will have a single battery that can charge all four cameras at once. However, please note that the rig package does not include stitching software. The video can be stitched with Autopano Video or other third-party software. The full package, which will include the rig, four 8mm Rokinon lenses (custom shaved for maximum POV), Arborist file sorter software, and remote control will cost $3,199. In April, this package will be expanded to include a battery. With cameras included, the package will cost $15,099. The entire system can be rented from $725 (if you own the lenses and rig) to $1,500 per week (this is the cost to rent the entire package). Rentals will begin in mid-March. Here is Bonsai’s official website. You can also check their YouTube channel here. We have a similar custom A7s II rig. The problem is with this solution, that the lenses and sensors are very far from each other, so the parallex effect is very high. :/ You need to direct the scenes and the actors to avoid the stiching lines. I see! Thank you very much Pasztor. I've inquired with Bonsai to determine what is the minimum distance to avoid parallax and am still waiting for their response.